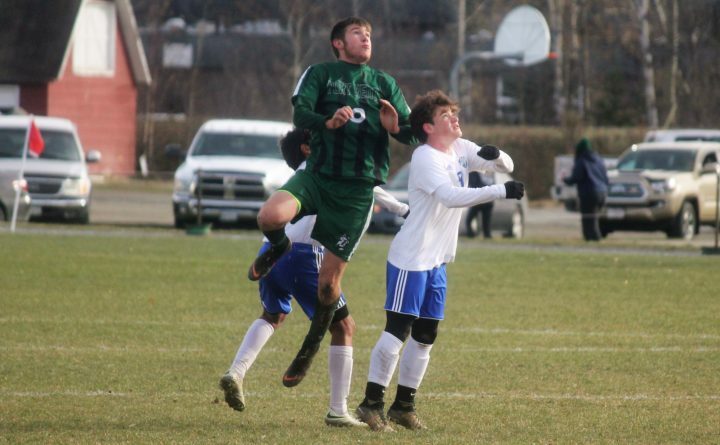 HAMPDEN, Maine — The Waynflete School of Portland hadn’t been scored upon in more than four matches entering Saturday’s Class C boys soccer state final. But when Fort Kent senior Kayden Nadeau ended that stretch of defensive dominance less than four minutes into play at Hampden Academy, the undefeated Flyers didn’t panic. Instead they relied on the challenges survived from a rugged regular season to rebound quickly and rallied for a 3-1 victory for the school’s first state title since 2011. Waynflete, whose schedule included matches against Class B South powers Yarmouth, Greely of Cumberland Center and Cape Elizabeth as well as against Class D South top seed North Yarmouth Academy, finished with 15-0-3 record. Fort Kent, seeking its first state championship since 2010, fell in the state championship match for the second straight year and concluded this season at 14-3-1. Fort Kent’s early focus produced an early lead as sophomore midfielder Noah Martin lofted a centering pass toward the goalmouth from deep along the right wing. Nadeau split two defenders and got to the ball first, then popped a shot over the head of charging Waynflete goalkeeper Luca Antonlini to give the Warriors a 1-0 lead just 3:36 into the contest. “I thought that goal would put us in the driver’s seat so that we could get some more,” said Kotes. Waynflete quickly regrouped and scored the equalizer less than 11 minutes later as junior forward Asker Hussein headed in Patty Shaw’s corner kick with still 25:34 left in the half. Fort Kent continued to generate some counterattacking threats but Waynflete maintained the bulk of the possession time. A 40-yard blast by Oliver Burdick over the head of Fort Kent goalie Reece Pelletier with 9:44 left gave Waynflete a 2-1 halftime lead. Another long shot by the possession-oriented Flyers, this one Shaw’s 30-yard turnaround bid from the right wing into the upper far corner of the goal, marked the only scoring of the second half. “We were waiting for them to bring the ball to us and you can’t give them any space,” said Kotes of Waynflete’s long-distance scoring. Senior midfielder Austin Plourde tried to rally Fort Kent with two threatening bids later during the final 15 minutes of play. First was a low shot from the left wing that skidded along the wet artificial turf before the diving Antonlini was able to tip the ball just wide of the far post. Moments later, Martin curled a 30-yard attempt that looked to be headed just inside the right post, only to have Antonlini race to that spot and knock the ball away. Antonlini finished with seven saves for Waynflete while Pelletier made six stops for Fort Kent.